I find it useful to allow pictures to ‘cure’ for a time before deciding which ones I like. Sometimes the images that appeal most at first viewing don’t survive the passage of time and re-viewing. Too obvious, too garish, too shallow, too derivative – there’s a host of reasons why an image that at first seemed to be a ‘keeper’ later seems uninteresting. Or even embarrassing. But others emerge from the archive after being neglected at first glance. Or else I find myself going back to look at them or work on them some more to try to reveal some hidden potential. Perhaps it is just that my taste changes over time. Anyway, here’s a picture from March 2013 that I’d put in that second category – of emergent keepers. 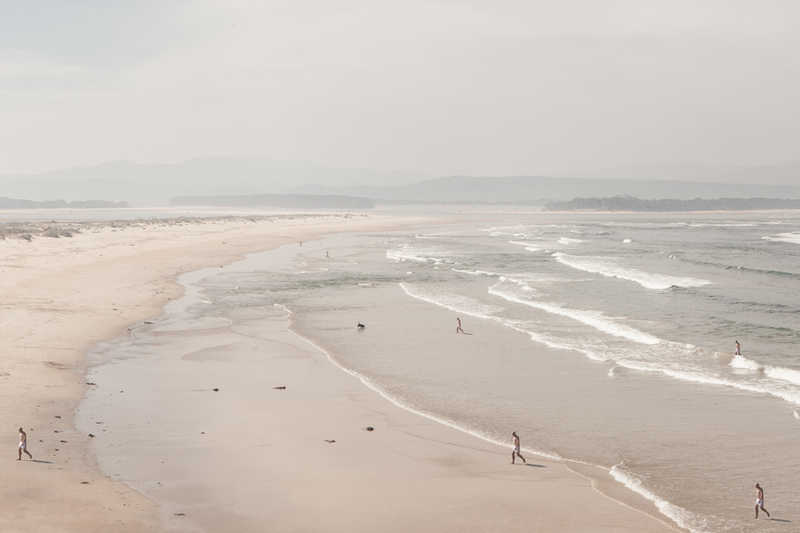 The scene was captured at Mallacoota on the ocean beach, on a hazy afternoon with pale sunlight filtering through sea spray. I liked the man emerging from the surf in his white swimming trunks. As I worked on the image in Photoshop, I came to imagine him as some kind of amphibian creature arriving from the deep ocean, rather than just an ordinary bloke who’d gone out for a quick dip in the surf on a warm day. I cloned him several times to create a ‘troop’ (a ‘flotilla’, a ‘school’?) of identical figures all reaching land simultaneously. The waves and the walking men give a nice strong feeling of movement from the right to the left side of the picture. It was late at night when I worked on the image, and I drifted into thinking of those high school science pictures showing the evolution of life as sea creatures started colonising the land. Then of some kind of aquatic zombie invasion. But mostly, I imagined sea turtles during their seasonal arrival to lay eggs in beach dune nests. On the day when I first arrived at the headland and looked along the beach towards the inlet, the light and framing of the scene had me thinking of the quality of light in the beach photography of Massimo Vitali, whose work I had recently been looking at. Harry Gruyaert. Picardie region. Bay of the Somme river. Beach of the town of Fort Mahon. 1991. The Turtle Nesting, Mallacoota picture was made as part of my project on South East Coastal Adaptation – you can see other pictures from the series at this link.